It’s falsely assumed that VMware is the source of many performance problems since it is relatively new in the datacenter. Others will claim it’s not VMware but the underlying storage. To break this cycle there are now many new acronyms being introduced to the SAN Storage / VMware environment such as VAAI, NPIV, SIOC, SATP and PSP - but what do they all mean and how do they benefit the IT organization? How does one guarantee that these new storage initiatives will easily fit your existing environment, reduce performance problems, and reap benefits instead of adding more complexity and a new set of problems? Even without such initiatives, how does one maintain an application’s performance once it’s been virtualized and how does one accurately determine how many VMs to deploy on an ESX server in I/O-intensive environments? 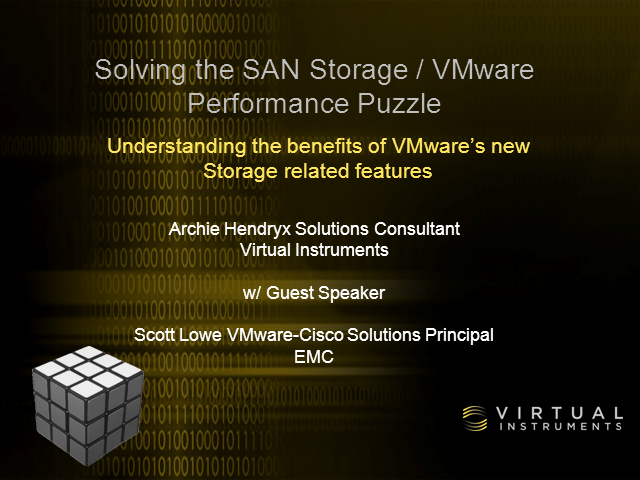 Join Scott Lowe, VMware-Cisco Solutions Principal for EMC and Archie Hendryx, Senior Solutions Consultant for Virtual Instruments, as they address these issues and provide insights as to how a comprehensive view, from the VM to the LUN, is imperative for further consolidation and safe Physical to Virtual migrations of your Tier 1 applications.